Agencies thrive on creativity. Whether it’s coming up with a winning client proposal, creating a cutting-edge style guide, or mapping out a new business model for working with overseas clients, agencies are fueled by new ideas and innovative solutions. But many insist that creativity cannot be forced. You have to wait for it, or let it happen on its own, they say. But agencies need creative solutions today. How can agencies harness the power of creative thinking on command? Here we’ll outline four ways science can help unlock the power of creativity. Making connections : When we think of great ideas, we often mistakenly believe that they are “original.” Not so, according to science. Many of the best ideas come from connecting existing ideas up to unfamiliar domains. For instance, how would the designs for an ad campaign change if you thought of them as music? This might appear to be a strange experiment, but such a technique, known as “synesthesia,” is a highly effective—and scientific—way of generating “new” ideas. Refresh : Seriously. According to a recent survey, 72% of people experience bursts of breakthrough creativity in the shower. What’s the science to this? It turns out that most people have creative insights when they’re away from their work or during idle moments that don’t require strenuous mental activity. Taking a shower is one such instance where our brains are left to their own devices. During these periods of “downtime,” many of us experience our most profound creative moments. Anonymity : According to science, many of the best ideas are criticized—even ridiculed—before they become widely accepted. To allow such seemingly wild ideas, agencies should create spaces for divergent thinking that won’t be immediately criticized. Facilitate brainstorming sessions in which participants can write down ideas and submit them anonymously. This will let team members feel free to think openly while being unencumbered by “groupthink” and other ways of enforcing conformity. Respite. According to science, many creative insights occur—consciously or not—while one is dreaming. 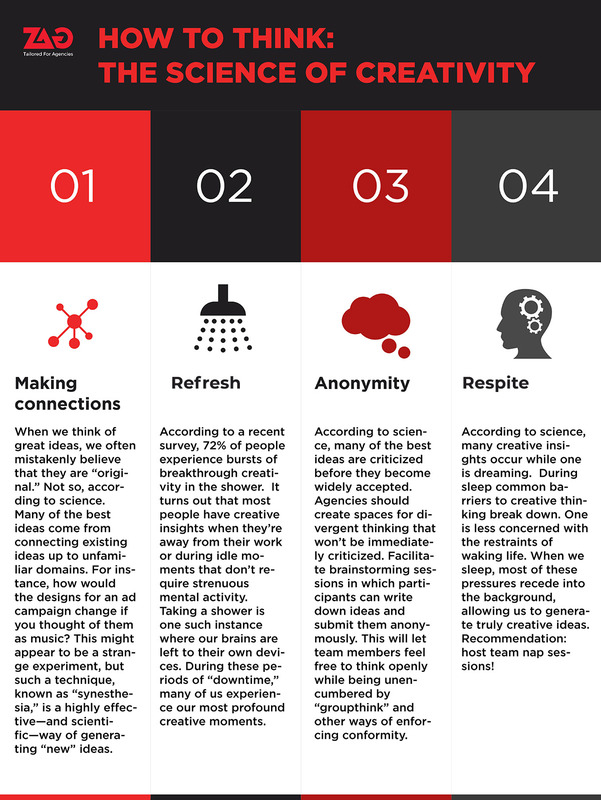 During sleep common barriers to creative thinking break down. One is less concerned with the restraints of waking life, which constantly pressures us to consider basic things like feeding ourselves and answering emails. When we sleep, most of these pressures recede into the background, allowing us to generate truly creative ideas. Recommendation: host team nap sessions!